James Joseph Dresnok, the only known U.S. soldier to be still living in North Korea after he defected more than five decades ago, died last year, his two sons confirmed. 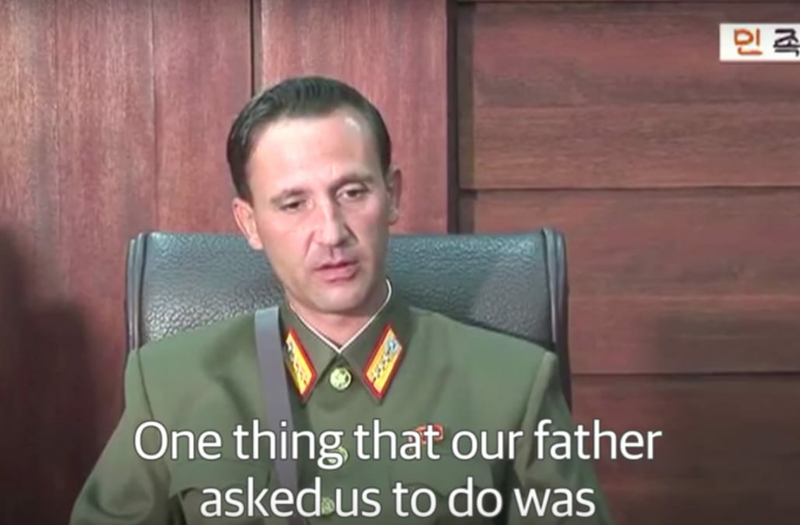 Dresnok pledged his loyalty to the "great leader Kim Jong-un," his sons Ted and James Dresnok said in a video interview posted on the state-run Uriminzokkiri website. They confirmed their father had a stroke last November. "Our father was in the arms of the republic and received only the love and care of the party until his passing at age 74," said Ted Dresnok, the elder of the two. Both sons wore a Korean People's Army uniform, complete with a badge depicting the country's founder, Kim Il-sung and his son and successor Kim Jong-il. Both men were born in North Korea and spoke Korean with a heavy northern accent. Their father was among a handful of American servicemen to desert following the Korean war, crossing the demilitarized zone in 1962. Known as Joe, he crossed a minefield at age 21 to reach North Korea after his wife divorced him, and he was reportedly about to be court martialed. He appeared in North Korean propaganda films and was believed to be the last U.S. defector in the secluded country, the others all having died or been allowed to leave, according to The Guardian. "Our father asked us to render devoted service to our great leader Kim-Jong-un," said Ted Dresnok, whose Korean name is Hong Soon-chol. The brothers not only confirmed their father's death and praised the North Korean leader, but they also commented on the current tensions between the U.S. and North Korea. A view shows a Pyongyang city mass rally held at Kim Il Sung Square on August 9, 2017, to fully support the statement of the Democratic People's Republic of Korea (DPRK) government in this photo released on August 10, 2017 by North Korea's Korean Central News Agency (KCNA) in Pyongyang. KCNA/via REUTERS ATTENTION EDITORS - THIS IMAGE WAS PROVIDED BY A THIRD PARTY. REUTERS IS UNABLE TO INDEPENDENTLY VERIFY THIS IMAGE. NO THIRD PARTY SALES. SOUTH KOREA OUT. NO COMMERCIAL OR EDITORIAL SALES IN SOUTH KOREA.? Servicepersons of the Ministry of People's Security met on August 10, 2017 to express full support for the Democratic People's Republic of Korea (DPRK) government statement, in this photo released on August 11, 2017 by North Korea's Korean Central News Agency (KCNA) in Pyongyang. KCNA/via REUTERS ATTENTION EDITORS - THIS IMAGE WAS PROVIDED BY A THIRD PARTY. REUTERS IS UNABLE TO INDEPENDENTLY VERIFY THIS IMAGE. NO THIRD PARTY SALES. SOUTH KOREA OUT. A general view shows a Pyongyang city mass rally held at Kim Il Sung Square on August 9, 2017, to fully support the statement of the Democratic People's Republic of Korea (DPRK) government in this photo released on August 10, 2017 by North Korea's Korean Central News Agency (KCNA) in Pyongyang. KCNA/via REUTERS ATTENTION EDITORS - THIS IMAGE WAS PROVIDED BY A THIRD PARTY. REUTERS IS UNABLE TO INDEPENDENTLY VERIFY THIS IMAGE. NO THIRD PARTY SALES. SOUTH KOREA OUT. NO COMMERCIAL OR EDITORIAL SALES IN SOUTH KOREA.?? People participate in a Pyongyang city mass rally held at Kim Il Sung Square on August 9, 2017, to fully support the statement of the Democratic People's Republic of Korea (DPRK) government in this photo released on August 10, 2017 by North Korea's Korean Central News Agency (KCNA) in Pyongyang. KCNA/via REUTERS ATTENTION EDITORS - THIS IMAGE WAS PROVIDED BY A THIRD PARTY. REUTERS IS UNABLE TO INDEPENDENTLY VERIFY THIS IMAGE. NO THIRD PARTY SALES. SOUTH KOREA OUT. NO COMMERCIAL OR EDITORIAL SALES IN SOUTH KOREA.? A general view shows a Pyongyang city mass rally held at Kim Il Sung Square on August 9, 2017, to fully support the statement of the Democratic People's Republic of Korea (DPRK) government in this photo released on August 10, 2017 by North Korea's Korean Central News Agency (KCNA) in Pyongyang. KCNA/via REUTERS ATTENTION EDITORS - THIS IMAGE WAS PROVIDED BY A THIRD PARTY. REUTERS IS UNABLE TO INDEPENDENTLY VERIFY THIS IMAGE. NO THIRD PARTY SALES. SOUTH KOREA OUT. NO COMMERCIAL OR EDITORIAL SALES IN SOUTH KOREA. Ted Dresnok cautioned that the "U.S. imperialists" were raising "war hysteria madness," claiming that Americans are knowledgeable about neither North Korea's military nor its people. If war breaks out, he said, "we [North Korea] will not miss the opportunity and wipe the land of the U.S. from the Earth forever." Tensions have escalated between the two countries since the North Koreans tested two intercontinental ballistic missiles last month that could potentially reach the United States. U.S. President Donald Trump ratcheted up the rhetoric by saying the U.S. would bring "fire and fury" upon North Korea if it didn't stand down. "We have our dear supreme commander Kim Jong-un. If he is by our side, our victory is certain," said James Dresnok, Korean name Hong Chol, in the video posted on Friday.